Now an NC State graduate and biotechnology lab technician, Ian Chapman utilized electronic lab notebooks as a student. The $105 lab manual once required for a popular NC State biotechnology course is now history. With a grant from the NC State Sustainability Fund, several biotechnology instructors successfully piloted a switch to electronic lab notebooks (ELNs), which improved the student learning experience, provided career-ready experience and boosted affordability. During the fall 2016 semester, 281 biotechnology students in several courses began using the online system in lieu of purchasing the $105 textbook and $5 notebook. Collectively, that avoided an estimated $30,000 in student purchases, as well as 63,000 pages of paper. The electronic system enables students to upload and annotate lab images, receive instant updates to lab protocol and access the program from any internet-capable device. In an anonymous post-course survey, students indicated that the online system helped them learn scientific concepts, increase confidence and improve note-taking during labs. The switch also translated to better grades. With the same course instructors, students using the electronic system achieved higher grades on the first lab report than the previous semester’s students who used paper notebooks. 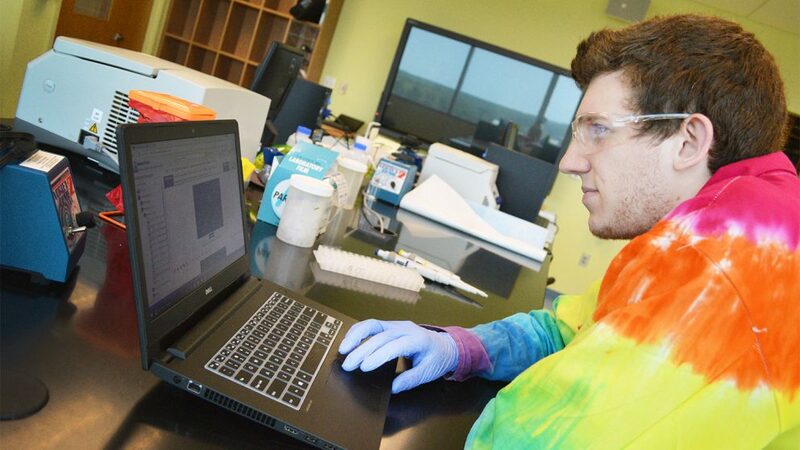 To kickstart this sustainability project, the Sustainability Fund financed the purchase of lab laptops, as well as the system’s user fees during the pilot program. It’s likely that future students will pay the user fee, but currently it’s $13 ‒ a fraction of the previous textbook’s cost. Published in Faculty, Materials and Purchasing, News, Newswire, Uncategorized, Zero Waste | Change Your State.